Modern and spacious ground floor with large terrace in listed residential a few minutes from Ibiza town and the marina of Marina Botafoch. 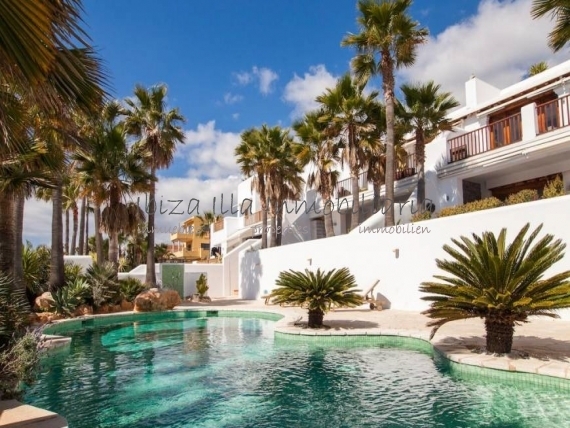 Savina beams, natural stone walls, wooden floors and beautiful palm trees are the hallmarks of this building of few neighbors built in Ibizan style. The apartment has 2 double bedrooms and 2 complete bathrooms, large living-dining room with open kitchen and access to the large partially covered terrace from where the views go through the fantastic communal pool surrounded by sun loungers and lush vegetation. Supermarkets, coffee shops and restaurants are just a walk away. Playa d'en Bossa, Salina and Es Cavallet are the closest beaches a few minutes away. An apartment with a lot of character and charm that has the advantages of having an apartment because of the low maintenance it requires and also those of a house because of its spaciousness and open spaces.